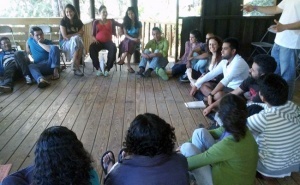 Ana Elia co-organised the first Regional Academy, a Global Environments Network event, in Latin America. She writes about her experience, from idea conception to implementation and beyond. For the Spanish version, click here. 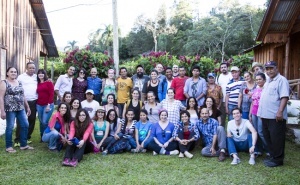 Several months have passed since we convened the first Latin American Regional Socio-Environmental Leadership Academy (ALLSA; Spanish title: 1a Academia Latinoamericana de Liderazgo Socio-ambiental) in Jarabacoa, Dominican Republic, from November 13 to 22, 2015. When I remember that gathering, I get goosebumps. With the passage of time, the dust that was stirred up has started to settle and now, in the awakening of another Canadian spring, I have the opportunity to reflect on the experience of ALLSA. My intention is that these words serve as thanks to everyone who made this experience possible. I also hope that these words, together with the testimonials of participants and mentors, inspire you to organize a regional academy in your corner of the world and help develop regional networks of young people concerned about the socio-environmental injustices in their communities. 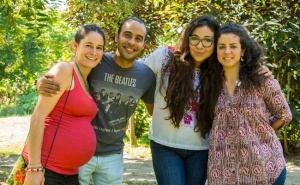 ALLSA organizers (L-R): Antonia Barreau, Daniel Abreu, Yolanda Lopez and Ana Elia Ramon Hidalgo. Here’s how it all started: in 2014, four alumni of the Global Environments Summer Academy (GESA) were moved by their experience. 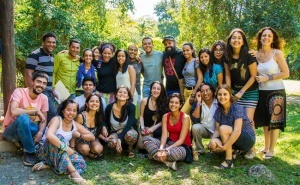 Conscious of the need to transform socio-environmental pedagogies and paradigms at a glocal level, we became engaged in organizing a regional academy in Latin America. 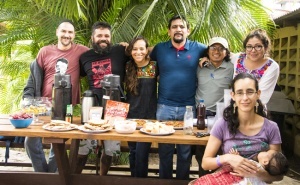 Antonia Barreau, Yolanda López, Daniel Abreu and I wanted to help so that young Latin American researchers and practitioners could meet to collectively explore transformative environmental learning and our relationships with biocultural landscapes. 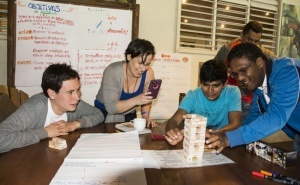 We aspired to create a dynamic co-learning space and process that would catalyze young leaders’ capacity to act and inspire more people to work toward the great social and environmental transformation, from small communities to international fora. We imagined a bioculturally focused, post-disciplinary  event that would not privilege any single epistemology. Instead, we wanted to create a dialogue among them. As part of the process of co-creation, we drew up a conceptual document in which we locate ourselves close to the wide umbrella of constructivism inspired by Paolo Freire’s liberation pedagogy, which originated in Latin America. In this document, we emphasized that we do not consider leadership as an institutional position, but rather as an adaptive social role for mobilizing consciousness to promote social change for the common good. 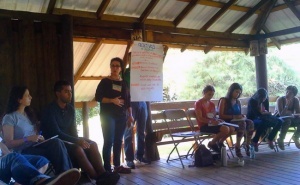 Generate connective processes, creating and strengthening interpersonal networks that promote joint actions among participants after the event. I believe that one of the keys of the success of ALLSA was the diversity of countries of origin, gender, communities, indigenous and local perspectives as well as the diversity of personal and professional experiences that were represented in the group of finalists and mentors. Merelyn illustrates this well when she said that at ALLSA, one found oneself in the other and that it being such a diverse group helped her reflect on her own identity and responsibility to create similar spaces in the future. Another key to success were our mentors, experts both at regional and global levels who facilitated co-learning in different spaces through experiential workshops, discussion circles, research cafes and field trips. Having witnessed in past GESAs the potential of an academy structured around the combination of fluid co-learning spaces, together with mentors and participants, we designed an agenda adapted to our needs as a community in progress. For example, Daniela Biffi led one of our creative preludes and taught us how to play the Peruvian Food Chain Jenga, a fun methodology she invented to facilitate reflections and conversations around the connections that exist within a complex system and inspired from the Jenga tower game and marine ecosystem modelling. The co-learning methodologies used surprised some and helped some of us to learn by leaving our comfort zones. As Antonio Sánchez explains, “[at ALLSA], I have been able to leave my comfort zone as never before. I’ve come to understand that the abysses between science, leadership and philosophy are not as deep as I had previously thought (…) I feel committed and strengthened.” Antonio Sánchez, El Salvador. At ALLSA, we learned from each other and inspired each other to continue questioning our societal models. Alfonso was inspired by “the strength and the energy with which my colleagues are promoting small actions which, connected with others, have glocal effects.” Alfonso Morillo, Dominican Republic. Another of the recurring reflections among participants was the importance of establishing ties in order to propel future projects. A regional gathering in Sonora in 2017 to analyse socio-environmental themes of interest to young indigenous professionals. Creating a collection of myths from oral tradition that speak to human-nature relationships from the perspective of different cultures across Latin America, to put them in dialogue and show the diversity of ancestral biocultural wisdom, for teaching children and youth. Emerging group of participants interested in community water resource monitoring. 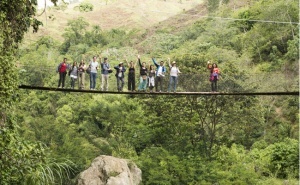 Participants from the Dominican Republic manifested their interest to coorganize a reforestation project. 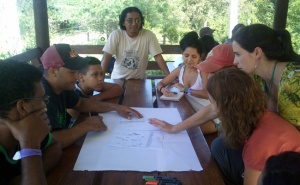 The development of a Latin American network of youth engaged in work related to conservation and biocultural landscapes. ALLSA members also envisioned the organization of a gathering of network members. In this gathering, youth from diferent countries and cultures would meet to share and strengthen motivation and competencies for leadership as well as to promote cooperation to support biocultural diversity. Creating future events with youth in a format similar to that of ALLSA. Peru, Chile and Mexico were mentioned as possible locations. Also one of the ALLSA participants shared her preliminary research ideas for a PhD and was offered support by other ALLSA members to help with the process of coming up with a thesis proposal. ALLSA concluded on November 22, but we continue to be in contact through the GEN network, LinkedIn, email, Whatsapp and Facebook. Each one of us has returned to our activities, yet in some form or another, ALLSA remains with us. In addition to what has been discussed, our recipe required important ingredients like clear vision, perserverance, patience, confidence and human, social and financial resources. It also needed a deep sense of commitment to our habitat and its co-inhabitants. But as with any recipe, each cook adds their own personal touch. Hopefully future regional academies will be nurtured by the experiences and learning methodologies from ALLSA 2015. Hopefully they will improve them and adapt them to their local context. Here I leave you with a few reflections from ALLSA participants on what we could improve in future ALLSAs or regional academies. Alfonso recommends “establishing a mechanism for following up with and strengthening the network, as well as for achieving the commitments that people have taken on”. The good news for Alfonso and all participants is that through the GEN InterNetWork – an online communications and networking platform – about to be launched, ALLSA participants as well as the more broad GEN alumni will be able to continue collaborations and discussions begun during the academy.